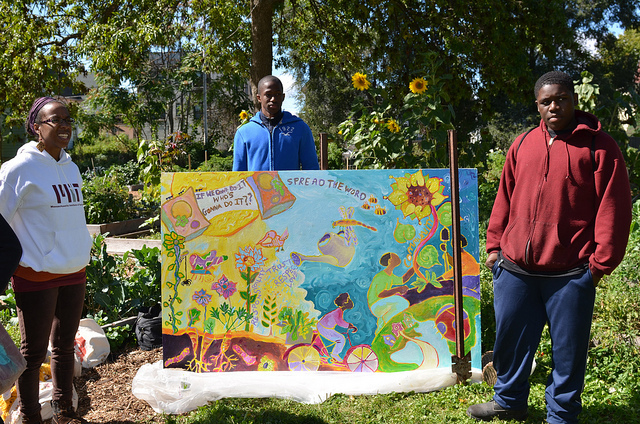 Young Farmers of Milwaukee recently celebrated its second year of programming with the unveiling of a 6-by-4-foot mural at Victory Garden at Kilbourn Park. Young Farmers trains high school youth to create “mini CSA” (community supported agriculture) projects. The portable mural, a collaboration between artist Tia Richardson and Young Farmers, was created to highlight the impact agriculture has on the environment and communities. CSA participants and community residents gathered in the garden to hear members of Young Farmers share their favorite stories about their work. “(The mural) is the result of numerous hours of collective brainstorming, planning, sketching and painting, and born from a space of compassionate listening to each other’s stories,” according to a Young Farmers press release. Young Farmers staff hope to find the mural a home at a shopping mall or local business to increase awareness of its mission and organic food-growing services.